It is said that captains weep when their ships are beached at Alang. At this maritime necropolis in Gujarat, the aged behemoths of the sea arrive to rest in pieces. Infernos belch sparks and spew toxic fumes as the scream of searing metal swallows the cries of seagulls. Death looms murkily over the ship-breaking yard, and not for the vessels alone. Decommissioned and docked for the last time against a backdrop of condemned vessels, the ship is hauled to the slaughterhouse, where workers strip it to fragments. Acetylene torches scythe yawning gashes on the rusty stern. Then the fallen corpse is shredded. The engine, diesel motor, pumps, winches, crane, radar and electronic equipment are sent to be reincarnated in a shipbuilding yard 30 km away. 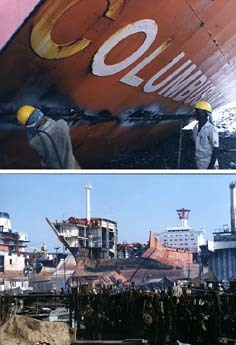 The demolition is carried out with structural precision to prevent the ship from careening on its keel. Large windows are torn into the hollow hull to let in light for the workers. Pulleys and chains transport the dismembered chunks towards the land. In four weeks the ship is reduced to nearly half its original volume. By the eighth week, it disappears completely into secondhand markets and steel rerolling mills in the hinterland. Death looms over Alang, and not for the ships alone. As acetylene torches scythe gashes on the rusty stern, workers toil without helmets or safety masks, battling toxic chemical fumes. "Every day one ship, every day one dead," goes a saying in Alang. Coughing workers brave the stench of burning plastic wafting through dense palls of asbestos dust. Cylinder blasts, fire and falling objects constantly stalk these labourers, most of whom are migrants from Bihar, Bengal and Bangladesh. Health, hygiene and pollution standards are flung out of the nearest porthole, as they toil for low wages, without basic safety masks or helmets. Unaware of the hazards, they are vulnerable to fatal illness from inhaling heavy metal fumes and toxic chemicals like polycyclic aromatics and dioxins in paints and other chemicals. Joining a German Greenpeace team led by Andreas Bernstorff, sent by 'Association of Friends of Large Merchant Ships, Hamburg', this correspondent visited the ship-breaking yard at Darukhana in Mumbai. 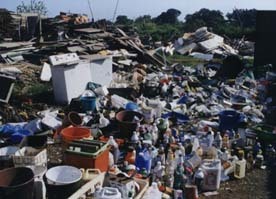 Heaps of plastic waste litter the yard and effluents choke the sea. In November last, Greenpeace led a campaign against the export of ships containing toxic materials to Asian scrapyards. "Of the 45,000 ships in the world, about 700 are decommissioned every year, after about 29 years at sea," said Bernstorff, adding that ships built around 1970 contain more asbestos, polychlorinated biphenyl (PCB) and compounds of toxic heavy metals like cadmium, arsenic, lead, chromium, copper and zinc. In November, Greenpeace and Basel Action Network (BAN) targeted Alang, campaigning against the export of ships containing toxic materials to Asian scrapyards. India gets about 500 every year, supplying plants with 15 per cent of their raw steel. Heaps of plastic waste litter the yard and dangerous effluents choke the sea, contravening international regulations and enduring the apathy of the government. 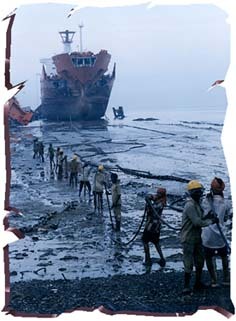 As the midday heat competes with scorching chemical fires, workers troop in and out of the hollow shell of what was once a massive container ship, waiting for salvation to touch the littered shores of Alang.